On my way to the supermarket I pass a man fixing bicycles, a place that can repair virtually any article of clothing and at least three shops that can solve any problem on almost any cell phone. This culture of fixing things instead of throwing them away is something I deeply admire. 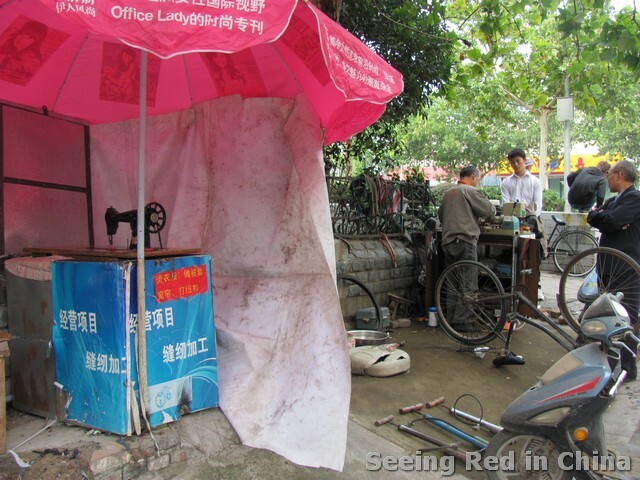 In Longzhou I had a flat tire, so I went to the repairman who worked behind a newspaper stand just off campus. His body was a rich brown, and he hardly had any hair left on his head, just a few wisps combed over. He only spoke the local dialect, and I could only speak Mandarin, but he knew what I wanted when he saw the sorry shape of my bicycle. He pulled a tiny stool (maybe 8 inches off the ground) out of his toolbox for me, and motioned for me to have a seat. Over the next thirty minutes, he patched the tube in my tire, calibrated the spokes to make sure the wheel was straight, and replaced a missing ball bearing. In spite of his elderly appearance, he was quite spritley around the bicycle, as if his work brought him back to a time when he had first begun working on them. For all his trouble he charged me just 1.5rmb (~$.12). The cost of any repair in China is surprisingly low; a new button for your shirt ~1rmb, re-soldering wires in your cell phone ~20rmb ($3), even fixing a water heater only cost me 90rmb ($13). For most foreigners living in China, it’s a welcome surprise. If you’ve read my post, Back from Europe with new thoughts on China, you know I enjoy contemplating the connection between business, culture, and gov’t. So while it is tempting to say that Chinese people are just more thrifty than Americans, or more environmentally aware, I don’t think that’s really what is happening here. Let’s be honest, goods manufactured in China don’t always last as long as we would like them to, and that’s the export quality stuff. Items produced for the domestic market tend to be even worse. I have heard that the quality is getting better though. In the 80’s, shortly after opening up, people could only afford “礼拜鞋” (libaixie), meaning “one week shoes”, but sometimes they didn’t even last that long. So when given lemons, the Chinese people made lemonade. Refunds on these things were not an option, and people’s salaries weren’t high enough to be able to replace even the lowest quality goods, so repairmen abounded. And because of the plentiful work, repairmen were able to charge lower prices, since they knew there would be no shortage of demand for their skilled repairs (it’s not uncommon for a repairman to exceed the original quality); not just in the period of opening up, but throughout China’s history, as there has always been a large underclass. Today the practice remains, even though salaries are higher and goods are better quality, labor is still incredibly cheap. Meanwhile in the US, cheap Chinese goods and the high cost of labor have developed a culture of waste. When your cell phone breaks, you would hardly consider trying to find someone to fix it unless it was under warranty. In general high salaries create a great number of benefits, but it also leads to a more disposable culture. I hope that as wages rise in China, they find a way to continue this culture of repairs. By T in Uncategorized on October 3, 2011 . The complete opposite of Hong Kong. Definitely a huge advantage to living in China. I really wish this kind of service was available back in the UK. We’re set up to just replace cheap crap with more cheap crap, like you say. “It’s not uncommon for a repairman to exceed the original quality” is so true – good on those guys! UK people who lived through the 2nd World War were urged to “Make Do & Mend” and that generation took it to heart. My old Dad always mended things for my sister & her American husband when he visited them. One day Dad mended their faulty lawn mower and my brother in law objected as he said Dad was putting factory workers out of a job! Dad threw a massive strop and said that a life time of thrift was the only way he managed to save money for the airfares to visit them from Britain. UK-USA good relations were only restored when my brother in law humbly apologised.